This was one of the best books I have read in a long time. I ordered this book by mail and recieved it on Friday afternoon and started reading it instantly. It is now sunday afternoon and I just finished it. I want so badly to talk to this lady to see how she is today!! To read how uncaring so many people were is so heart breaking to me. There were the few that took the time to be more attentive but everyone should have been that way!! I am a nurse at a Houston hospital and I see nurses and other staff act like that everyday and it breaks my heart because I am a very caring nurse and go above and beyond to help my patients. Every nurse needs to read this book to see how people can be feeling when you treat them that way!! I would recommend this book to everyone I work with and know!! I am an RN and all too often, patients are faced with uncaring caregivers who perceive meeting patient's needs as "too much trouble". If there is a medical person who perceives Sue as a "whiner", I would not want that person to enter my room! The book is a compelling novel, I could not put it down! It included wonderful stories of her travels and family. I wished the book was longer, I hated for it to end. I cried throughout the last portion of the book because it was so touching. The one thing I think it lacks is getting its point across to caregivers. Some caregivers are too uncaring to fully comprehend the torture Sue went through lying there day after day, unable to move or speak, being at the mercy of others. I put it on my list as one of the best books I have ever read! I can relate as a "Fellow Comrade"
I read this book after spending five weeks in ICU, followed by four months in a Rehab Center...recuperating from Guillain Barre Syndrome. I can relate to how she had favorite nurses...so did I, and being totally paralyzed it may be hard for others to understand just how much that extra little fluff of the pillow makes after laying for eight hours in the same position. My body was very sensative, and any movement was painful...I can imagine how much more painful it was with her. The things I found hard to understand in the book were the thoughts she had in her day to day activities....oh, I would be driving by the supermarket now, on my way to pick up my best friend Bonnie...these thoughts are just hard for me to believe. I know my thoughts were like "when will these leg spasms quit...when will I walk again...when will the aching in my legs get better...when will I get out of here....how much is this costing....when is my next therapy" these were my thoughts. The book does give a good view of just how devastating GBS can be. For me....It will be 4 years this Christmas since my GBS attack, and I am still not well. From the waist up I am about 95%, and from the waist down I am about 50% which includes leg and feet numbness, muscle spasms/cramps,joint pain, and stiffness. But I feel blessed to have back as much as I do, and I pray that God will give me the strength and courage to continue my recuperation from this catastrophic illness. As an RN with an interest in medical-related writing, I started this book thinking I would be reading an inspirational account of a woman overcoming a terrifying illness. Instead I was treated to a whine-fest of gargantuan proportions. Yes, Sue was very ill and frightened, but instead of devoting more energy to fighting the _illness_, she seemed to focus almost entirely on separating the staff who cared for her into "good guys" and "bad guys" and presumed to project her personal judgments of insensitivity onto the staff she didn't care for. As an RN with over ten years' experience, I felt a chilling familarity while reading this author's words. I have known many patients like this who "play favorites" with staff, and who turn against anyone who doesn't devote his/her entire shift to satisfying their every whim. "Oooh... why doesn't she come sooner when I call?" "Ohhhh, how come he's so rough with me..? Why can't he be like so-and-so [other therapist]?" "Waaaah! If only all these insensitive people knew what it was like to be as sick as I am!" The perpetual whining destroyed for me any pleasure I could have derived from the knowledge that this lady got well and left the hospital almost fully recovered. And she is (or was) traveling the country giving speeches to health care workers on how to treat patients? Please, spare me. This book fills a huge void in the areas of medical education and the delivery of patient service. 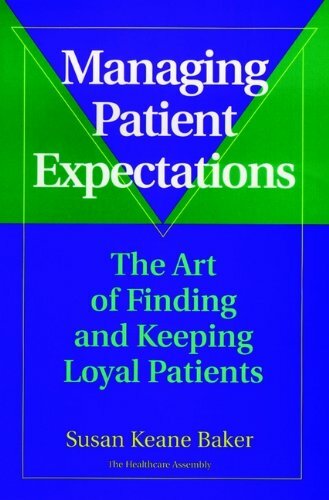 The clear advice about how to identify and respond to patient needs and preferences is essential reading for physicians and those who work with them.If the personal rewards of medicine are important to you, read this book. This important resource describes how to develop the qualities of understanding, empathy, and compassion that help to meet and exceed patient expectations. Managing Patient Expectations is filled with realistic and cost-effective strategies for maintaining patient satisfaction, creating loyalty, and increasing referrals. Susan Keane Baker explains how to find out what patients really think and how physicians can best respond in a variety of situations. Co-published with the Healthcare Assembly Press. 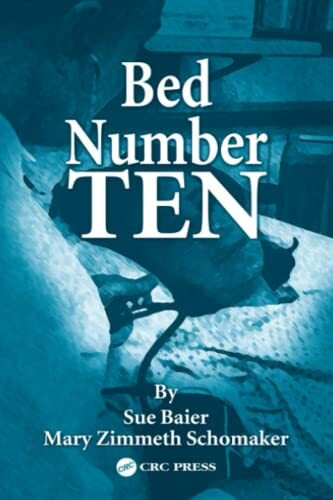 Susan Keane Baker has so much knowledge in this important area of health care and she shares with us her many insights and suggestions in an interesting, easy-to-read manner. This is definitely a book for all health care professionals and executives to keep on a nearby shelf as a ready reference over the years. Susan covers so many topics that are essential for patient retention, such as anticipating patient needs and preferences and making sure that patient complaints are dealt with in a timely and caring manner. As a longtime consultant in patient communication myself, I can testify that my colleague Susan has done a superb job with this book. Its all there - which makes this 5 stars for sure. It's easy to see why this book is a top seller! There is so much valuable, pragmatic and helpful information in this book! The woefully underestimated value of listening, the best way to handle a patient complaint, creating a "patient -friendly" environment. It's all here...presented in an engaging, well organized and insightful manner. Satisfying patients goes far beyond taking surveys. I recommend this book to all my clients! I bought this book after Press Ganey recommended it in their October 1999 client advisory newsletter. 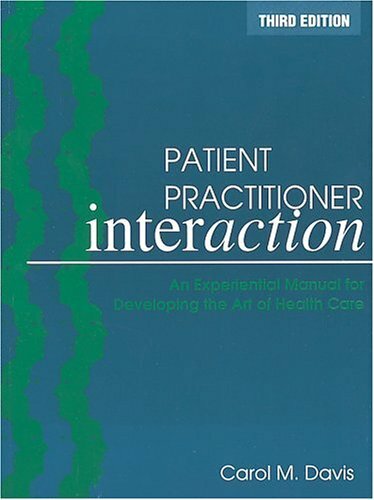 It's full of practical ideas that anyone working in a health care setting can use. Excellent! Terrific and easy to read guide for any practitioner. Just could not put it down. Gets to the issues that plague our healthcare system and helps physicians and other provider recognize the "best pratices" available to them to retain patients. Patients should enjoy this book as well to confirm their rationale for demanding medical and service excellence. It's a must read for all quality improvement directors, risk managers and administrators alike. A doctor who is also a long-term patient examines the body, in sickness and in health. Jamie Weisman was a patient long before she was a doctor. She was born with a rare defect in her immune system that leaves her prey to a range of ailments and crises and that, because it is treatable but not curable, will keep her a patient for life. Her history has graced her with a deeper perspective -- a second sight, in a sense -- on the body itself, in all its frailty, glory, and irreducible mystery. In this probing and inspiring book, Weisman brings her sojourns on both sides of the doctor-patient divide to bear on the issues of the flesh that preoccupy us all. She considers the randomness of illness, and the fears and fortitude it calls forth in those it strikes. She weighs the economic and moral value of sustaining any given life. She explores the vulnerabilities of the body and of those who care for it, including their capacity for error. And she conveys, by eloquent example, that the only cure for the fear of death is living. As I Live and Breathe is a view of medicine from both sides of the trenches, embracing the patient's fervent desire for health and the doctor's fervent desire to grant it. It is a worthy addition to the best that has been written about our physical selves, a meditation on our extraordinary powers of healing and the limitations that leave intact the miracle and tragedy of being. Written by Jamie Weisman, a physician-patient with a rare, hard-to-diagnose illness, the reader sees all facets of a medical mystery. What was really frightening to me was the length of time it took to diagnose Weisman's condition, despite the fact that her father, a doctor, was always there, questioning, observing, yet unable to help. She endured years of frustration, pain, anguish, and physical deformity before being diagnosed with a congenital immune deficiency.It is controlled through monthly treatments with gamma globulin and by self-injections every few days with interferon. There is, however, no cure. Her illness inspired Weisman to go to medical school, and she is now a physician at Emory in Atlanta. She writes eloquently about how she practices medicine while dealing with her illness. Her harrowing story makes for tough but compelling reading. I could have done without the last sections, "Begotten" and "Begetting", or at least a shorter account of her attempts to have a child. Otherwise this book read like a medical thriller. I really couldn't put this book down once I got started, which was about 44 hours ago. This book is autobiography or memoir (I really don't know the difference) and is a quick read at 243 pages because Jamie Weisman herself is only 36 or 37 years old. What is compelling about this book is Weisman's honest look at her congenital immune deficiency, the way she has dealt with and the way it has affected the significant people in her lives (her parents, her husband). A big part of the way that she has chosen to deal with this disease is by going to medical school and becoming a doctor. One of the most powerful passages in the book is when she writes, "...... I start medical school. I come to know far more about immune deficiencies than my father does. I find my own doctors and Emory University and begin making my own decisions about my health care...... I have relieved my father of the double burden of not only loving me while I am sick but also having to be my doctor" (pg 194). This passage is powerful for me because, to my mind, she has taken responsibility for her life, gained as much knowledge as possible about her condition, and is relying on herself to manage it. I also really liked the fourth chapter, "All Too Human", where she talks about the inevitability of errors in medecine. Doctors are people, too; hospitals are worked in by people. Too many people just treat doctors like omniscient gods but they are not; they are limited and fallible people, like everyone else. The third chapter, "Beautiful Failure", is mainly about a surgeon who removed a hideous lump from her face and gave her back her appearance. There is a twist and it is really a powerful and beautiful chapter. The book lost a little steam for me in Chapters 5 and 6 though it picked up a bit after that. Weisman is now a mother and the final chapter "Begetting", is mainly about her struggles to become pregnant and her fears of complications due to her condition. All in all, a courageous struggle, an interesting look at the practice of medecine and an honest look inside one person, and her family's, life. After witnessing the painful treatment and deaths of my in-laws recently, I was most interested in the author's account of her unbearable pain when her face was infected, and the problem she had in obtaining relief. She was a doctor herself and the staff knew her--yet she still had to beg for hours for relief. When will the medical profession treat pain adequately? I am disappointed that after enduring so much pain that she does not recognize this need. Overall, her courage is admirable, and we need more doctors who have endured chronic illness to write accounts that enlighten the general public. Beautiful, Elegant, & Wise! A TERRIFIC MEMOIR! I feel lucky to have been able to read this absolutely exquisite, yet at times gut wrenching, personal memoir, by a very gifted author who, it should be noted, is over twenty years younger than me. As one who has a very limited real life knowledge of medical life and death, it was an eye opener to (what sometimes seems) a completely different world. This is not only a sublime course in medical history and ethics, but a harrowing landscape of how the body can go wrong in myriad ways, and how the medical profession works its genius. The author has been through it from both sides too, and does not flinch in the telling. Not to be missed! Having read thousands of great books in nearly all fields, this is among the all-time best! 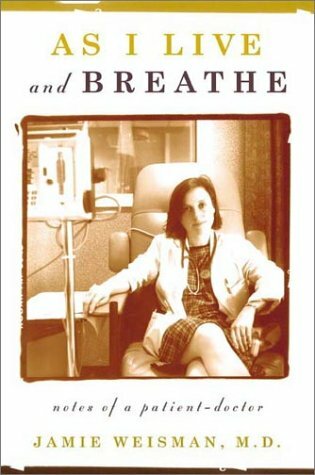 Dr. Weisman provides an insightful look into the unique life of a "patient-doctor" in As I Live and Breathe. She battles a chronic, severe immune system illness, at the same time juggling a medical career that is both rewarding and disheartening. The fight for life is sometimes won and sometimes lost, but she keeps a positive attitude through it all. This comes from the exceptional experience that she encounters everyday, through her disease. She uses the knowledge that she has gained from her own illness to create compassion and true sympathy for the patients that she treats. This is unique; this is where most doctors are lacking. She shows both the understanding and knowledge that is rare in the medical profession. This autobiography is not only about health and medical experience. It is about everything any human being encounters: marriage, childbearing, dealing with the loss of a loved one, and all the trials that comes with them. Dr. Weisman simply puts a spin on life, expressing it to the audience from a different point of view. She ponders on the unique perspectives of all the patients and families that she treats, and finds a positive force in all of them. She learns from her mistakes to help them better their lives. In a way, it is a sort of cycle, both parties feeding off the other. The power of family is important, she says; it provides an amazing support system for a patient that is much needed. She speaks fondly of her own family and the support that they provide, giving them credit for their undying courage and love. In wonder, she says, "I have never had to stand by and watch a loved one suffer the way my family has stood by me." She also admires her husband, saying, "[There was a] mix of joy I felt at asking another human being to share in the ambiguity of my life. I credit my husband with tremendous courage in loving me, someone whose future is from the start more fragile than others'." The relationship between family and patient is extraordinary, and Weisman does a wonderful job of depicting this with the sheer honesty that comes with an illness. Contemporary health care often lacks generosity of spirit, even when treatment is most efficient. Too many patients are left unhappy with how they are treated, and too many medical professionals feel estranged from the calling that drew them to medicine. Arthur W. Frank tells the stories of ill people, doctors, and nurses who are restoring generosity to medicine--generosity toward others and to themselves. 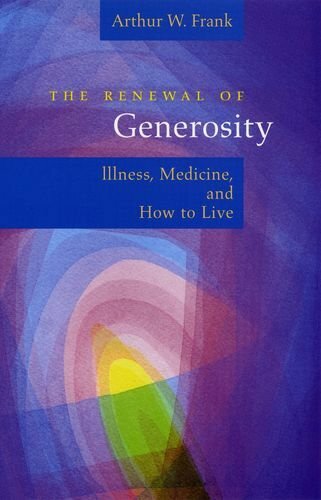 The Renewal of Generosity evokes medicine as the face-to-face encounter that comes before and after diagnostics, pharmaceuticals, and surgeries. Frank calls upon the Roman emperor Marcus Aurelius, philosopher Emmanuel Levinas, and literary critic Mikhail Bakhtin to reflect on stories of ill people, doctors, and nurses who transform demoralized medicine into caring relationships. 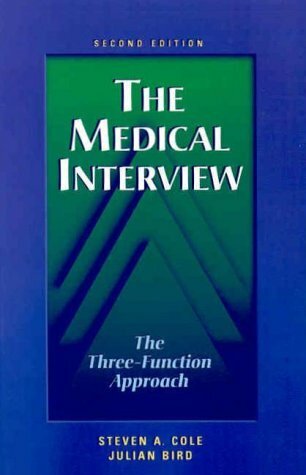 He presents their stories as a source of consolation for both ill and professional alike and as an impetus to changing medical systems. Frank shows how generosity is being renewed through dialogue that is more than the exchange of information. Dialogue is an ethic and an ideal for people on both sides of the medical encounter who want to offer more to those they meet and who want their own lives enriched in the process. The Renewal of Generosity views illness and medical work with grace and compassion, making an invaluable contribution to expanding our vision of suffering and healing. In this eye-opening look at the doctor-patient decision-making process, physician and law professor Jay Katz examines the time-honored belief in the virtue of silent care and patient compliance. Historically, the doctor-patient relationship has been based on a one-way trust--despite recent judicial attempts to give patients a greater voice through the doctrine of informed consent. Katz criticizes doctors for encouraging patients to relinquish their autonomy, and demonstrates the detrimental effect their silence has on good patient care. Seeing a growing need in this age of medical science and sophisticated technology for more honest and complete communication between physician and patients, he advocates a new, informed dialogue that respects the rights and needs of both sides. Are patients informed about their health care? Not always. I read this book years ago, and came to Amazon.com to try to purchase it. How delighted I am to see that it is being reprinted for publication. Though it was written a long time ago, its central conclusion is still valid. All too often, patients are not fully informed about health care interventions recommended to them by doctors. Thus, they often choose to undergo treatments that subject them to painful, demoralizing consequences that they were just not told could happen. Katz's examples may seem dated. For example, how many of us even remember the daily news reports of Dr. Barney Clark's tragic events after he became the first man to receive an artificial heart. But the paternalism he describes, the failure to trust that people can make good choices regarding their personal health care when fully informed still exists as we approach the millenium. How else to explain the hue and outcry when an NIH consensus conference failed to simply recommend mammograms ! for women aged 40 to 49? When they recommended that doctors talk to their patients, and that the patients then decide for themselves what is best for them, they were lambasted. To me, the world of doctor and patient is still all too often silent. And as the mammography example demonstrates, those who advocate breaking the silence are often treated badly. 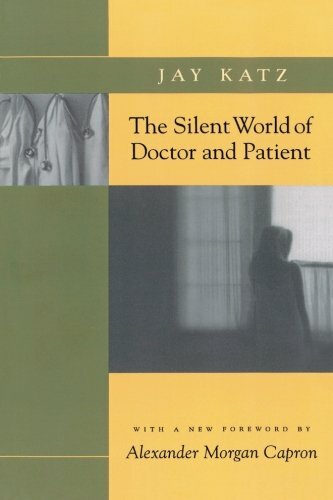 The Silent World of Doctor and Patient is well-written. It discusses the all too common failure of doctors to fully inform their patients about the risks they undertake when they recommend treatments. It tries to explain why such is the case. It reveals the sometimes horrible consequences that can befall patients when medical treatment goes awry. 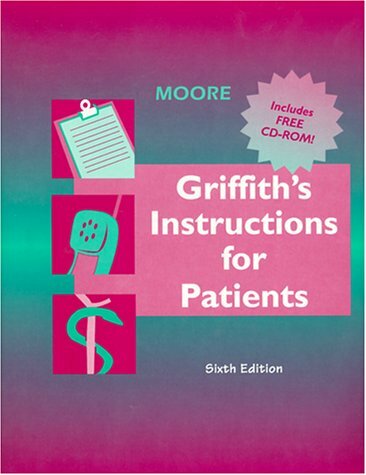 Intended to be a compendium of handouts for physicians to give to patients, Griffith's Instructions provides information on a wide variety of illnesses. From croup to tooth grinding, this book covers maladies both small, i.e. indigestion, and large, i.e. congestive heart failure, in a consistent, matter-of fact presentation. All of the perforated, pull out discussions include basic descriptions of the illness, including the frequent signs and symptoms, a brief synopsis of possible causes, risks, preventative measures, expected outcomes, and possible complications. Treatments are also discussed through both general measures and medications with notes on recommended activity and diet. 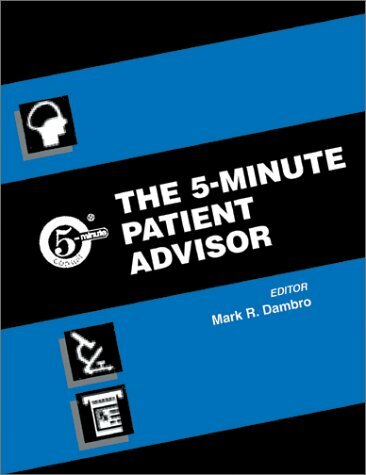 The 6th edition revises and updates all of the problems that patients regularly bring to their doctors discussed in the 5th edition and adds more than twenty new ones. 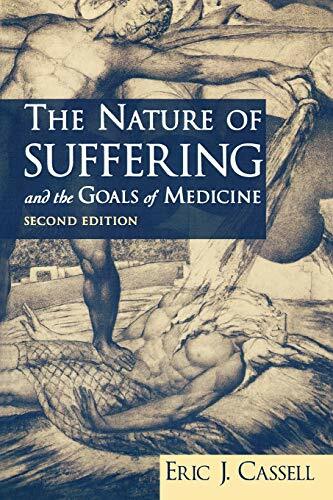 The first edition is already a classic in its exploration of the nature of suffering. "Bodies do not suffer, only persons suffer." is a central concept. 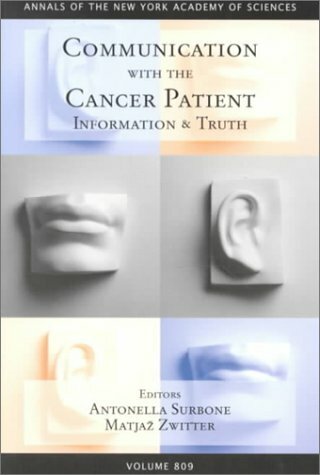 The text examines the doctor patient relationship, what diseases are, how understandings of disease have changed over time, how the unique and particular nature of the sick person influences all diseases and how they are cared for. How we know who a person is. Why medicine is changing its focus from the disease to the sick or well person. The new edition has three new chapters that focus on the mind-body problem, social contribution to sickness and dying, and how pain and other symptoms are inevitably personalized. And how suffering arises from the sickness and its personalization. It is a well-written,rich and exciting book. Very helpful for sufferers of chronic illness. The author identifies the effects of chronic and acute illness on each integral part of the sufferer, and describes personal attributes/approaches of patients that enhance their ability to live with their condition. This book is an inspiring insight into strategies for finding new meaning in life after loss of mobility and during years of living with chronic pain. I refer to it each time my condition has worsened my outlook; it never fails to help me find new strength. 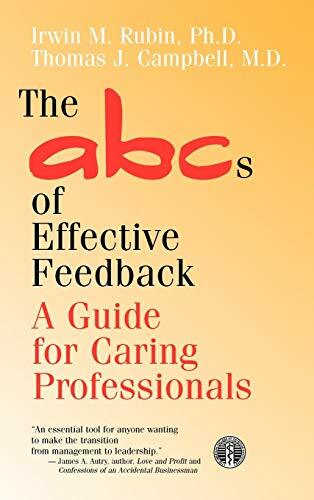 A much-needed, practical guide to giving and receiving feedback . . . a guide that is essential to the successful conduct of one of humanity's most important activities?productive conversation. Managing relationships, building trust, and communicating effectively are all essential skills to improving performance and ensuring the quality of patient care. This timely book offers the tools and techniques necessary to face the challenges of being a leader and resolving conflicts to produce win-win outcomes. Irwin M. Rubin and Thomas Campbell show how to eliminate the pitfalls of traditional feedback approaches and enhance the win-win quality of all communication. With vignettes, a case study, and pithy cartoons, the authors detail two dynamic tools to help chart a course to excellence in giving and receiving championship-level feedback. Their integrated four-phase feedback model and practical behavioral tools provide the ingredients essential to plan for and learn from our daily experiences. The definitive physician's guide to effective communication. This book could easily have been retitled: what I really should have learned in medical school about effective communication...but never did. The authors present an effective framework for not only learning basic communication skills, but for understanding the more fundamental behaviors which drive our language and communications. 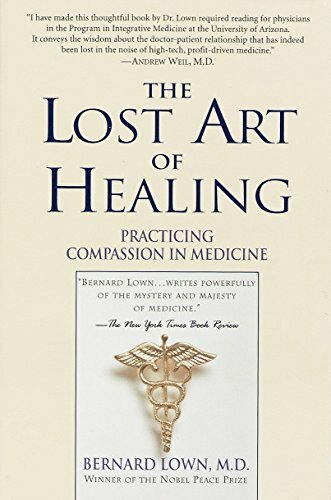 Always balancing their message with a caring, sensitive clinical perspective, (including several "right on target" examples) their message should hit home with every physician and caring professional who chose the healing arts as a labor of love, passion, caring and commitment. All too often, in today's healthcare environment financial pressures seem to take us further away than ever from the patient...changing us from patient advocate to adversary. The frustration is further heightened by the sense that "nobody really listens to us anymore." 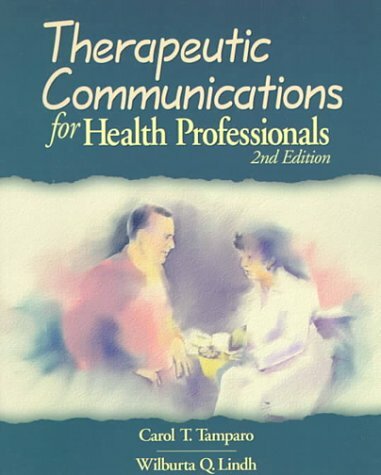 This book lays out a coherent, comprehensive, and compassionate approach to communication which, at its best, should enable and empower us to hear and be heard more effectively - not only with our patients, but with our colleagues, other healthcare industry leaders, and our families. I heartily recommend this book!!! Incredible resource for those committed to personal growth! Our body system is nature's most perfect creation, balanced by intricate systems of feedback and communication. Our personal lives and organizational lives are often devoid of feedback; somehow we have lost these essential skills. This book teaches us how to become Aware of our Behavior and its Consequences through an eloquent description of how healthy feedback can change us personally and corporately. As a Family Physician and teacher of Family Physicians, I am certain that the ability to give and receive feedback promotes more healthy relationships. This is the essence of sustainable growth and change. We all have the power to change ourselves and this book is a good way to start that process! The authors summarize their vast experience teaching executives how to give feedback to others...whether they be subordinates or equals. What needs to be fed back? How to "package" that feedback? What barriers keep us from trying? Why do we all think we are good at this basic function, when most of us are miserable and uncomfortable at it? This guidebook tells us how to do it and more importantly, tell us why we must. It stimulates and challenges and ends up inspiring us. It makes it fun. Our professional life is like our personal life. We have a duty to make others better and more productive. We need to invite others to help us to improve. Without feedback, there is no learning. Without constant learning, we stagnate. If we stagnate, our life was not worth living. So this book helps us to be better human beings. Read this book, then reread it. It's like a fine wine, getting richer with age. A useful gem of wisdom! 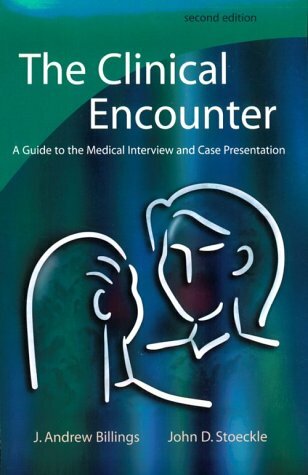 Very useful for health care practitioners and Hospital Chaplains who need an easily assessible answer to common areas of Spiritual concern for various faith groups. I showed my fellow Chaplain Interns this book and they are all ordering it. I am a hospice chaplain and pastor. I have found the book to be helpful in providing a very basic overview of some of the major cultural customs and beliefs regarding health and illness. Kirkwood, a protestant Christian chaplain, touches on the surface of some of the major facets of a broad sampling of religions and what they believe about health and illness. My main criticism of the book is that it does not give a thorough, or entirely accurate portrayal of all the different religious cultures that Kirkwood claims to address. There is such a plurality of beliefs and customs- even within one faith tradition, that a book of this scope is grossly inadequate, even for lay readers. You WILL learn some basic, very general guidelines- for instance general dietary concerns, attitudes towards autopsies and transfusions,etc. My greatest fear with this book is that healthcare professionals- or even chaplains will pick it up or another book like it and after reading it think that they know what a patient or family member would want based on what religious background they are affiliated with. 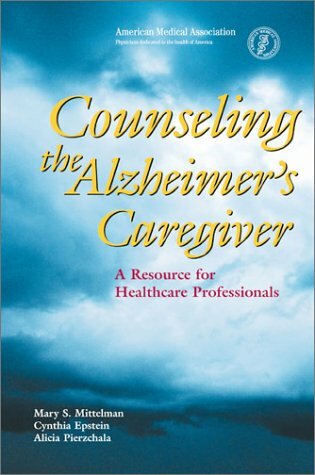 Your best resource for understanding a patient or family member's needs- religious or otherwise is still TO ASK THEM. The best way to understand another person's cultural beliefs is to allow them to educate us. Anton Boisen, the pioneer of modern Clinical Pastoral Education, once said that we are all "living human documents." In other words, general cultural knowledge is well and good, but it can NEVER relieve us, as caring professionals of the responsibility to properly inform, and learn the needs of those whom we serve- namely patients and family members. Ask them what their needs are, inform them properly, and give them the autonomy and respect they deserve. A must have for all hospitals! 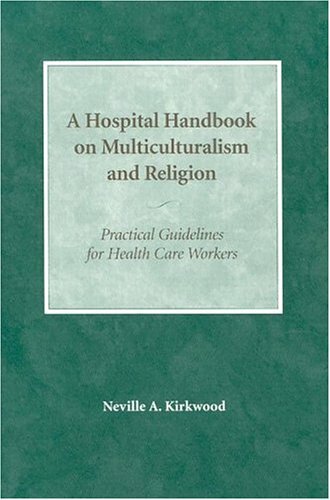 As a director of nurses, I found this book to be an invaluable tool when teaching staff about cultural diversity. 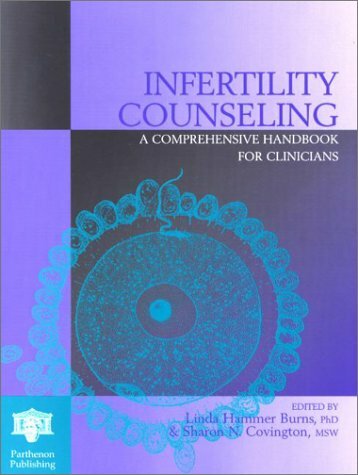 I attached this convienently pocket-sized book in nursing manuals on all of our patient care areas. This book covers most of the demographic populations that we serve. I highly recommend this book for healthcare workers in today's ever changing climate! Excellent! A must-read for doctors, nurses and chaplains. Excellent resource for all health care providers! The entire "5 minute consult" series is incredible. Easy to use and up to date ... you can't ask for much more than that in today's chaotic health care arena. Thanks to Lippincott for publishing such a necessary yet accurate product. Soy medico de Familia y el tiempo en la consulta medica en muy valioso pues veo muchos pacientes en el dia. El "Griffiths 5 Minute" me soluciono este inconveniente para mi y mis colegas pues es muy facil de encontrar lo que busco y define mi conducta frente a los problemas e inquietudes de mis pacientes. EXCELENTE! it is a handy book . Gives practical points in different titles. good book for quick reference. This book is essential in todays 15 min appt times to aid in quick workups of problems, speedy diagnosis and treatment of the problem. I found the book very shallow and typical. The book barely scratches the surface of this complex subject. Definately NOT worth the money. Offers intercultural trainers one more solid learning tool. Rena Gropper has selected a proven tool, the cultural assimilator for addressing critical incidents faced by healthcare professionals in increasingly diverse patient/caregiver relationships. In Section One, the Introduction, she explains her choice of this method and rebaptizes it "intercultural sensitizer." Rightly so, as it's purpose is less to encourage assimilation, than to alert clinicians to the dynamics of difference in healthcare encounters. Section Two contains 43 (my count -- it would have helped to number them) critical incidents that involve largely Asian, Latin, Native American, African American, Rom Gypsy and Muslim patients and professionals. There are representative questions from other cultures as well. Section Three gives the user feedback on his or her choices for each situation. Finally, Section Four revisits cultural behaviors briefly but coherently by topic and ties them into a general perspective. Until too recently cultural information about patient-caregiver interactions was buried in medical monographs and professional journals, at best handed on by cognoscenti to their interns and associates. Diversity programs have been largely aimed at workplace relationships, not diverse patient needs.